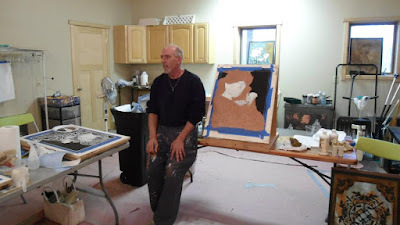 Hallie Coletta grew up in an artistic environment. She was raised in Rockland County, New York, 30 miles north of New York City, and lived near many famous people in the arts: Kurt Weill and Lotte Lenya, John Houseman, Richard Pousette-Dart, Maxwell Anderson, and Burgess Meredith, to name a few. Her father was a prominent violist and her mother was a painter and an antique dealer. Hallie began her career as a children’s book illustrator after attending L’Accademia di Belle Arti in Venice, Italy. For the next decade she honed her artistic skills working as a jewelry designer, sign painter and muralist. Growing up next door to Adolf Zukor, the founder of Paramount Pictures, had a powerfully influential effect on her life, since she’s always been fascinated by black and white movies. 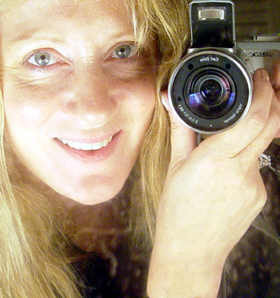 In 1986, she was accepted into the United Scenic Artists Union, working on her beloved films, Broadway shows and television in the NY Metropolitan area. 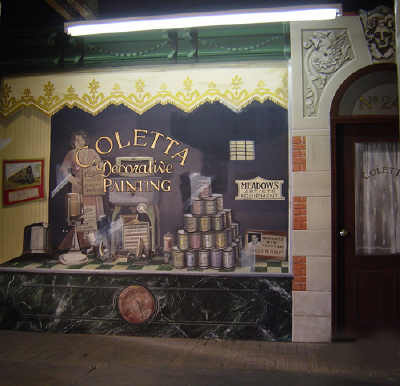 Ms.Coletta’s work as a scenic artist put her along side the best artists and designers in the industry and she is grateful for all the tricks of the trade that she learned from them.Here is a partial list of work done from 1986 to 2000: TV -Saturday Night Live, The David Letterman Show, Ed. FILMS- Coming to America, Wall Street, Ransom, Sabrina, Godfather III, Elmo in Grouchland BROADWAY – A Christmas Carol, Oz, Carousel, The Inspector General.In 2001, her love of painted ornament steered her back into the real world with the formation of Coletta Decorative Painting, working with interior designers instead of production designers. She opened her business at The Garnerville Arts & Industrial Center, a 19th century brick factory complex which is the home of some 120 artisans, light industry and artists (www.garnervillearts.com). One of the photos shown here is part of a 25’ long mural she painted outside her shop. It is a life size display of all the kinds of painting she is best known for: murals, trompe l’oeil, borders & friezes, grisaille, lettering, marble, gold leaf, painted doors, canvas reproductions and stenciling. This coming August, Ms. Coletta will participate in an exclusive pet trade show in Manhattan, called Pet Fashion Week New York. It is there that she will launch her newest company, Coletta Fine Placemats for Pets--a line of exclusive placemats for pet’s feeding areas. This idea came to her four years ago when a kitten wandered into her country kitchen…and stayed! Miss Coletta was inspired to design her new cat a cloisonné style canvas mat for his eating area. Her company was born when she saw how clean and beautiful the mat made her kitchen look. Designing this line of elegant pet mats has brought together Coletta’s passion for historic ornament with her extensive artistic experience and a talent for capturing the essence of styles from all over the world. She is thrilled to share her creations with pet lovers the world over, bringing function and beauty into their homes.